In this session, participants will learn about the growing influence of the social customer and how brands have responded by building social channels across the web. We will then examine how brands are now thinking about how to operationalize their processes, content creation, governance internally; and changing their business models at the same time. 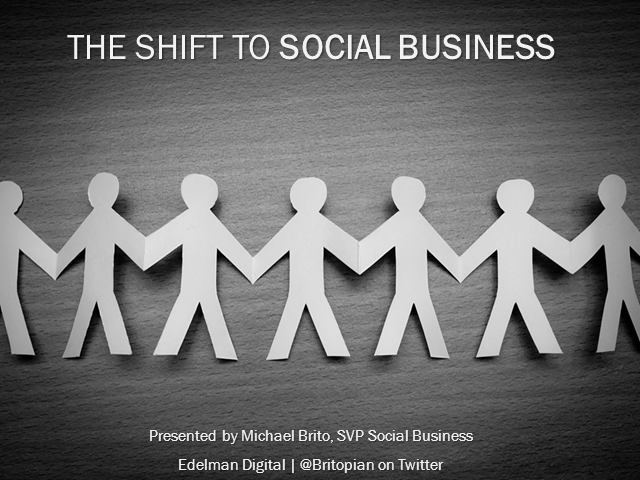 Michael Brito is an SVP of Social Business Planning at Edelman Digital. He is responsible for helping clients navigate and optimize their business internally in order to have more effective and meaningful interactions with customers, partners and employees. He is also the author of Smart Business, Social Business: A Playbook For Social Media In The Organization.